Located in Cresson, Pennsylvania, in the Southern Allegheny Mountains, Mount Aloysius College is adjacent to U.S. Route 22 between Altoona and Johnstown. 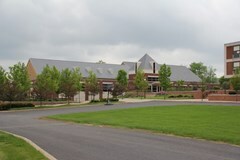 Ten buildings compose the administration, academic, athletic, and residence areas of Mount Aloysius College’s 193-acre campus. The administration building, also known as the Main Building, is a picturesque structure dating to 1897. 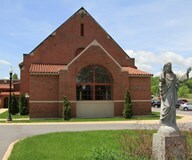 The Administration complex has four contiguous buildings: St. Gertrude Hall, St. Joseph Hall, Our Lady of Mercy Chapel and Alumni Hall. Administration and academic offices along with classrooms, computer labs, and an art studio as well as several high technology nursing simulation labs are located in the Administration building. Health Services is located in St. Joseph Hall. Alumni Hall, previously used for theatre productions and as an auditorium, has been newly renovated as a multi-purpose structure. State-of-the-art lighting and sound systems, telescoping seating and a new vestibule have given a fresh update to one of the oldest buildings on campus. Alumni Hall will now host not only new theatre productions and a speaker series but will also be used as a community meeting space and lecture hall. 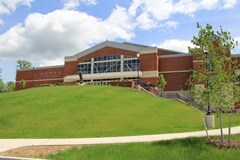 Cosgrave Student Center, the student union, is the hub for all student activities. The offices of the Vice President for Student Affairs, Student Activities and Residence Life along with the dining hall, Campus Police, snack bar, a lounge, and meeting rooms are located on the upper level. The bookstore, Ann Harris Smith Little People’s Place Childcare Center, and the McLanahan Recreation area can be found on the lower level. The 87,000 square-foot Athletic/Convocation and Wellness Center boasts premiere wellness, recreation, academic and athletic accommodations. The Athletic Center portion of the ACWC plays host to our men’s basketball, women’s basketball, and women’s volleyball programs. The gymnasium features a free-floating maple wood floor with room for 1,800 Mountie Maniacs to cheer on Mount Athletes. The Center houses the Mount Athletic Department, an auxiliary gym, multiple smart classrooms and meeting rooms with state-of-the-art technology, cardio and yoga room, a fully-equipped athlete training room and much more. The Center is also home to the Office of Student Affairs, the Office of Institutional Advancement and the College’s MBA and Business programs. The northwest corner of the ACWC features the Wellness Center. With an emphasis on strength training and conditioning, the Wellness Center includes cardiovascular stations, 14 circuit training stations, strength training using free weights and kettle bells and a special area for stretching and core exercise. The Bertschi Center and Technology Commons occupies central space on campus. The building sits just off the central red-brick walking mall that connects the Main Building westward toward the Library-adding access to Cosgrave Center and paths to two residence halls-Ihmsen and Misciagna along the way. It is a social and technology hub for both commuter and resident students. The facility is fully wireless with a wealth of outlets so students can plug in any and all types of electronic devices. The College’s Digital Grotto, the video and social media hub, is located within this building. The facility is also another campus event-venue, complete with kitchen facilities. 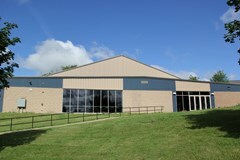 The Bertschi Center can accommodate over 300 attendees in its main event area. Academic Hall is an instructional facility housing classrooms, labs, seminar rooms and faculty offices. Pierce Health and Science Hall is a 31,000 square-foot facility which houses all laboratory science courses and certain allied health programs providing state-of-the-art instructional resources. The Learning Center for Health Science and Technology addition added nearly 20,000 square feet of new space and completely renovated the existing Pierce Hall. The Learning Center for Health Science and Technology offers Mount Aloysius students science and health-oriented learning environments that mirror their clinical sites. 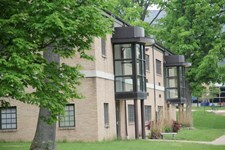 McAuley Hall, St. Gertrude Hall, St. Joseph Hall, Misciagna Hall and Ihmsen Hall are the housing facilities for resident students. 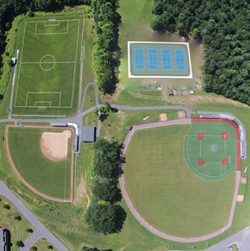 The Ray and Louise Walker Athletic Complex, located on the southwest corner of campus, provides Mountie athletes with premiere playing fields that include soccer, softball, baseball, tennis courts and an all-purpose hiking trail and a disc golf course. Located in the center of this complex are the Mountie Stables. The facility is new, comprising a two-story structure overlooking soccer, baseball and softball fields. Inside are locker rooms, lavatories, a viewing room and press box area with wireless capability, storage and concession distribution areas. The entire facility is ADA handicapped compliant. Both baseball and softball fields have home and visitor’s dugouts. 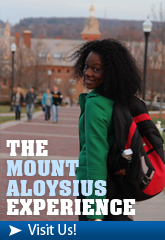 Mount Aloysius College’s facilities are open twelve (12) months per year and are made available to outside groups as scheduling permits. Students have ample access to computers. The College continually upgrades and expands all facets of the hardware and software that is managed. By doing so, our students are able to keep pace with dynamic technology. Laptops may be borrowed from the Library. The campus residence halls are wired for connection to the Internet and the College maintains a wireless environment. Four computer labs contain ninety-six computers that offer students access to the computer network, Internet, and e-mail. 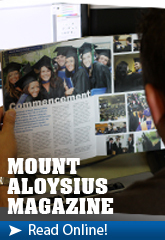 Every student is provided with a Mount Aloysius College e-mail account that can be accessed via the Internet. 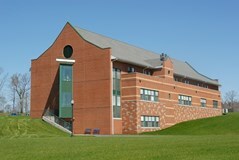 The Mount Aloysius College Library is located in a modern, 31,000 square-foot facility that was opened in 1995. It is designed to serve the needs of students, faculty, and staff with the most up-to-date print and electronic resources available. In addition to materials, the building is equipped with spaces and technology resources to support the College’s educational, research, and outreach missions. We have three group study rooms; one practice presentation room; one quiet study room; a large classroom; a reading lounge; and computer stations throughout the building. The Library also houses the Learning Commons, a full-service academic support unit. The Learning Commons provides professional and peer tutoring services; academic support workshops; supplemental instruction sessions for certain courses; and peer-facilitated group study sessions. Twice a semester the Learning Commons, in collaboration with the Student Success and Academic Advising Office, hosts All-College Study Nights. These events provide students with tutoring services, faculty-led study sessions, food, and relaxation activities to help students prepare for mid-term and final exams. Library and Learning Commons staff members are known for their high-quality and customer-friendly service. Here students and faculty find efficient retrieval, delivery, and circulation of information resources. Other services include reference assistance, scheduled information literacy instruction, copyright support, course reserves, printing facilities, and interlibrary loan. The Library offers a rich and varied collection of print, electronic, and other non-print materials that has been developed to support the curricula in all disciplines. In addition to a print collection of 75,000 books, we hold 150,000 ebook titles, a small collection of print journals, DVD’s, audio recordings, and laptop computers. We also provide access to 50 databases containing over 25,000 different journals and periodicals. ProQuest Central contains 800 full-text periodical titles including 600 scholarly journals. Mountlink, the Library’s online catalog, provides quick and concise information on publications and resources held in our collection. 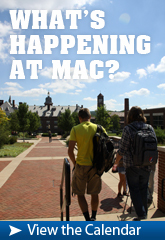 Students and faculty can access these electronic resources from on and off-campus.